While working dog breeds are big and beautiful, this type of dog might not be right for your family. While most of our pets today don’t do any more work than roll over for a treat, it can really help to know what your dog was originally bred for. How is this helpful? Each breed has certain tendencies that we’ve built into them over time, which can help you to understand your dog’s behavior. I’m going to stay true to my roots and focus on the CKC Working Group designations – it differs only slightly from the American Kennel Club. While I’ll only get into detail about the more common breeds (and a few of my favorites! ), you can see the entire list of working dog breeds on the CKC website. Generally, these types of working dogs are big, strong, and smart and need an owner who has some experience with handling and training, or is willing to learn. Not every family is suited to a working breed, as they typically need moderate to high amounts of exercise. Many of these breeds also have lots of fur, which was necessary for their outdoor jobs like guarding flocks and pulling sleds. I used to have an Akita as a kid, and my mom could never get over the amount of fur that she was constantly vacuuming up! But don’t worry, not every working dog breed has all that fluff – Rottweilers and Great Danes are two examples of shorter fur. And Portuguese Water Dogs are known for being hypoallergenic, as they shed very little. Alright, without further adieu, here are a few of the most common as well as my personal favorites from the working dog breed group! Here you have it – a truly Canadian breed. This is one of the oldest Arctic sled dogs, and as such, is powerful with loads of stamina and a need for activity. Definitely a family dog, he is affectionate, friendly, and loyal. Having a tendency to be stubborn, he needs a firm handler and obedience training from Day One. However, this breed loves exercise and all things fun, so it's easy to find something that you both enjoy... get him to pull the kid's sled up to the top of the hill and you'll both be happy! These guys have an interesting background. Bred by the former Russian Red Army to guard military posts, it’s a cross between the Airedale, Giant Schnauzer (which is where most of its looks are from), and Rottweiler. A big dog, he is assertive, extremely energetic, but with strong defense instincts. And despite its name, it really is not a terrier... supposedly around 20 different breeds went into creating the Black Russian Terrier! One of my favorite working dog breeds, the Dogue de Bordeaux! Definitely one of my favorite breeds, I just can't get enough of their wrinkly faces. This breed didn't really become well-known until after the movie, Turner and Hooch, came out. Originally bred for guarding and hunting boar and bear, he is, understandably, completely fearless and not tolerant of intruders. Although huge and powerful (males can weigh 145 lbs! ), DDB's are calm, patient, and gentle with kids. Really, though, this is not a breed for the inexperienced owner! This working breed is a large draft and water dog with natural lifesaving instincts. With webbed feet, they make exceptional teams in emergency sea rescue in France. As for temperament, you couldn't ask for a better family pet. Gentle, docile, and devoted, Newfs are obedient and easily trained. If you want a clean dog and a hair-free house, though, you'll likely want to choose a different breed... they love to swim and have a thick, double, burr/dirt/mud attracting coat! 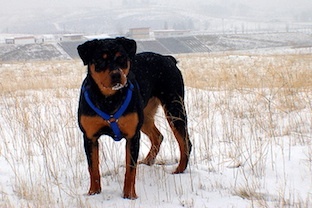 A very popular breed originating in Germany, the Rottie is used often in police and military work. Bred to have natural guarding instincts, he is courageous and will naturally protect his family. None-the-less, given an experienced owner and sensible handling, this breed can be a good family dog. Again, just like all of these large breeds, a Rottweiler is powerful and must be obedience trained from a young age! Unfortunately, these guys have gotten somewhat of a bad rap due to irresponsible breeding without regard to breed standards. Be sure to take your time when choosing a breeder to buy your puppy from! Working dog breeds need a job! If you already have one of these breeds, you’ll know what I mean… no job = bad dog. And that’s really no fault of your dog; he was bred to work and help humans, so without a proper outlet, you may very likely catch him herding the kids at your child’s birthday party into a corner. Or pinning the mailman down every day. Or trapping the cat in a closet for hours on end. Or shredding all your shoes to bits and pieces. Let’s face it. 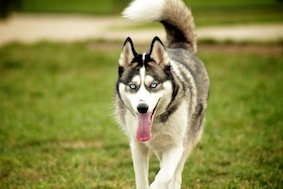 Dog sledding with your Malamute may not be the most convenient activity for exercise. And you probably don’t have a herd of cattle in your backyard that your Giant Schnauzer can round up. But it is worthwhile to look at his original job and try to find something similar that he can do to keep busy. A tired dog is a happy dog! What are some ideas to keep your working breed well exercised and happy? Use your imagination! 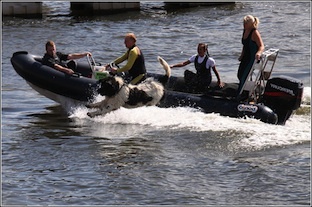 A Newfoundland or Portuguese Water Dog will love swimming in your pool, at the beach, or even at the cottage. Your Siberian Husky or Bernese Mountain Dog? Train him to pull you on rollerblades, or try skijoring (pulling you on cross-country skis). You might even find that you enjoy recreational dog sledding. 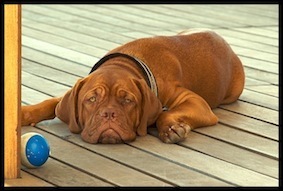 A Dogue de Bordeaux will excel in many different dog sports and activities, such as obedience, carting, or therapy work. 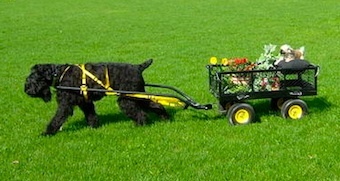 Rare Black Russian Terriers are amazing in obedience or agility competition, and will also do well in search and rescue. It really doesn't matter what type of working dog breed you have, they will excel in most dog sports and activities. If after taking everything into account, you feel like your family can give one of these big guys a good life, find a reputable breeder in your area and enjoy the traits that were bred into your working dog!